Scientific research on our cultural heritage, both for the study of its material aspects and for designing and controlling conservation and preservation strategies, faces a diversity of changes due to the complexity and intrinsic value of the materials and objects. Furthermore, environmental conditions all over the world have inflicted increasing damage or at least deterioration of surfaces meant to be created for eternity. By conventional techniques we are able to ameliorate most of the dangers, but new approaches of high technology must be explored to preserve the heritage of human civilization as well as art works of former generations. Since the very beginning of investigation, preservation, and conservation-restoration of our cultural heritage, chemistry has been playing an important role in documentation, studying ancient production of materials and art technology, understanding of degradation processes and present state of works of art, as well as developing and evaluating new materials and methods for interventions of both, movable and immovable art works. In the last decades the booming developments in chemical science, especially in analytical, organic or environmental chemistry, but also in the fields of electronics and computer sciences has brought us new instruments and methods of great perfection, which present new horizons in the analysis, diagnosis and protection of art and cultural objects. 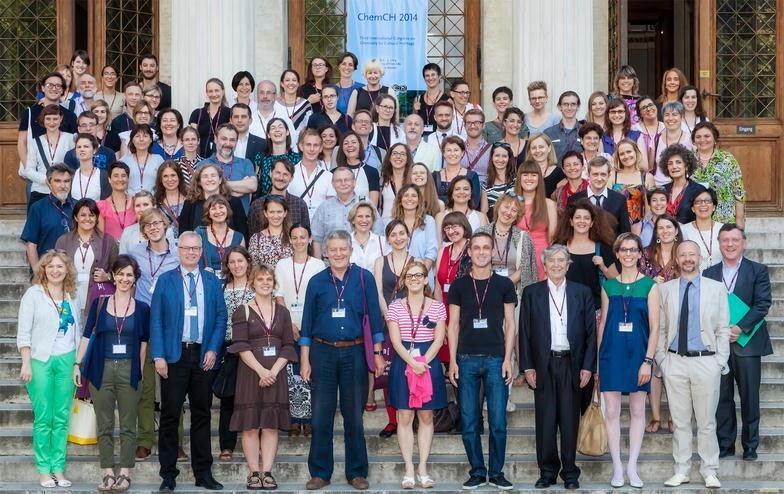 The 3rd international congress “Chemistry for Cultural Heritage—ChemCH-2014” was held from July 1–5, 2014 in the Aula of the Academy of Fine Arts Vienna, Austria. ChemCH is part of EuCheMS (European Association of Chemical and Molecular Sciences), which enforces the interdisciplinary aspects of natural sciences (chemistry, physics, microbiology, etc. ), the arts (art history, archeology, ethnology), and the conservation and preservation of our cultural heritage. The conference has been organized by the Institute of Science and Technology in Art, under the supervision of Univ.-Prof. Dr. Manfred Schreiner and his team. After successful conferences in Ravenna/Italy 2010 and Istanbul/Turkey 2012 this time Vienna gathered 170 participants, renowned scientists from 17 different countries from Europe, Asia, Australia, North and South America to discuss the newest findings in the field of heritage (Fig. 1). In 46 oral and 71 poster presentations 7 topics focusing on new materials and methods, stability of traditional and modern materials, chemometrics, nano and bio-technology and chemical imaging in the field of art and cultural heritage were discussed. There were also more than 60 graduate students attending the conference. The meeting opened with an address by representatives of the organizing and scientific committee: Prof. Dr. Rocco Mazzeo, Chairman of ChemCH in EuCheMS, Prof. Dr. Herbert Ipser, President of GÖCH—Gesellschaft Österreichischer Chemiker, Prof. Dr. Ulrich Schubert, President of EuCheMS, and the rector of the Academy, Mag. Eva Blimlinger, followed by remarks from the conference chair, Prof. Dr. Manfred Schreiner. The scientific program started with the first session, opened by invited speaker, Prof. Maria Perla Colombini (University of Pisa and Institute for the Conservation and Promotion of Cultural Heritage—National Research Council, Italy) pointing out the challenges and possibilities of organic analysis in art and archeology. The presentations of this session clustered around several challenges: non-destructive investigation of materials and painting techniques, new combinations of analytical techniques for complementary material identification, to modelling of indoor environments and to better understand degradation effects. The second plenary lecture in this session, given by Dr. Francesca Casadio (The Art Institute of Chicago) opened the discussions on new techniques for the identification of traditional and modern organic materials. Due to the innovation and improvement of many analytical techniques in all fields of research chemical imaging has found its way to be a highly valuable tool to investigate cultural heritage objects, which was also one of the key topics of this conference. Invited speaker, Prof. Koen Janssens (University of Antwerp, Belgium) opened this session presenting X-ray based imaging on paintings of the artist Vincent Van Gogh. Other speakers further explored imaging techniques and demonstrated the significant advances being made in this field. The second day of the conference focused on material degradation, with a plenary lecture by Prof. Matija Strylic (University College London) enlightening material degradation through the lens of heritage stakeholders, followed by interesting degradation studies of parchment, metals, glass, pigments, rubber and wood. The afternoon session on chemometrics was opened by invited speaker Prof. Kurt Varmuza (Vienna University of Technology) who showed the importance of mathematical and statistical tools for the extraction of relevant information from chemical data obtained. The last day of the conference was dedicated to new materials and methods for cultural heritage, and was opened by an impressive plenary lecture of Prof. Antonio Candeias (University of Evora and HERCULES Laboratories, Portugal) who raised awareness of the potential of biotechnology to investigate cultural heritage objects. Several speakers in this session outlined their groups’ efforts from nanoparticles to protective coatings on different heritage materials. The last session of the conference opened by Prof. Bruno Brunetti (University of Perugia, Italy) was dedicated to technical and authenticity studies of beautiful art objects and ranged from paintings to statues and codices. The contributions of the session could demonstrate the importance of scientific investigations by applying complimentary analytical techniques and of the interdisciplinary discussion for the syntagmatic determination of materials from paradigmatic data. Overall this successful meeting was a highly fruitful knowledge exchange on traditional and contemporary issues, such as long-lasting protection of cultural heritage objects, material stability of traditional and modern materials, influence of air pollution and non-destructive analyses for the documentation of art objects, to completely new and innovative ideas and approaches. Furthermore, the conference enabled international and multidisciplinary networking opportunities, especially for young scientists in this field. This special issue gathers contributions from oral and poster presentations during the ChemCH- 2014 conference. For the support and the publication of the themed issue the organization team would like to thank the editor and his team from Heritage Science.